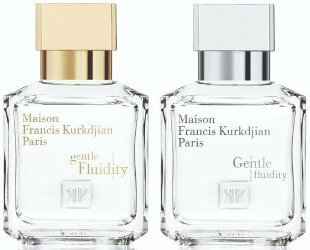 From Maison Francis Kurkdjian, the Aqua Fragrance Wardrobe: "Through this collection of six fragrances inspired by the tradition of eau de Cologne, Francis Kurkdjian dreamed up as many stories about water as there are possible silhouettes of freshness. Aqua Universalis captures the sensation of an airy and luminous floral freshness, while Aqua Vitae embodies an enveloping and sensual woody freshness, and Aqua Celestia evokes the allure of a soft and radiant musky freshness. For the first time all the fragrances of our Aqua collection are presented together in a Fragrance Wardrobe. On a short escapade or a longer journey, bring along your favorite Aqua, designed for women or men." For each of the three scents, you get one 11 ml of the Eau de Toilette and one 11 ml of the Eau de Parfum (forte) version. $215 at Neiman Marcus. 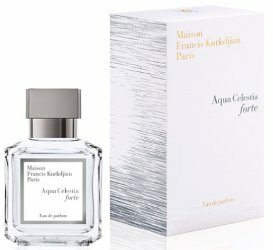 A quick spot for Maison Francis Kurkdjian Aqua Celestia Forte.